If you’re fond of new technologies and you want to join the ancient with new, Pompeii on 23th and 24th February is the perfect place, with the Exibithion market: radio, electronics and new technologies. 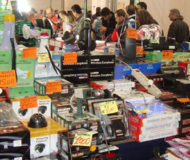 In fact maybe you’d like to visit the archeological site of Pompeii in the morning, then have a good lunch, visit the curch and, in the end, enjoy the Exibithion Market where various stand offers interesting objects related to computers, smartphone, ancient and new radio and much more. From 9:15 to 19:30 on Saturday 23th. From 9:15 to 18:30 on Sunday 24th. Tickets on sale at 5 €. Description: It will take place in Pompeii on 23th and 24th February the Exibithion market: radio, electronics and new technologies.